Posted on October 31, 2017 at 11:54 am. Online pokies players looking for a few extra spins should head to Mucho Vegas and claim the 20 free spins bonus on the Game of the Week. 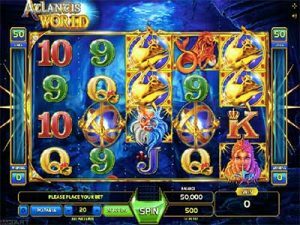 This week, Mucho Vegas has chosen Atlantis World, a 5 reel and 50 paylines title featuring Wild Stacks and Free Spins. All you have to do is deposit a minimum of €/$100 and wager it on the online casino game, which has a RTP of 96%, between Monday and Friday to receive 20 Free Spins on Saturday – the perfect way to start your weekend. The offer runs until November 3, 2017, so be sure to wager the full amount to get the 20 free spins. Winnings from the spins are wager free – you can make a withdrawal any time you want. There’s no limit on withdrawals either, as you are required to make a deposit to claim the bonus. Only no deposit free spins at Mucho Vegas have a withdrawal cap of €/$100. Each week the online casino selects one of its slots from its catalogue, featuring titles from BetSoft, GameArt, 1×2 Gaming, Pragmatic Play and more. The game is likely a title you haven’t seen or played before, with the huge range on offer at the Mexican-themed online casino, including table games and other real money gambling games. Since the free spins are wager free, the bonus is worthwhile if you’re looking to play poker machines anyway. Simply claim the offer when making a deposit using the several payment methods listed in the cashier. There’s a huge range of other promotional offers at Mucho Vegas, including Free Spins Monday, Midweek Reload Bonus, Taco Friday Bonus, and more. Each promotion comes with its own terms and conditions – be sure to read these to prevent voiding the offer. New players can also claim the €/$1500 welcome bonus, plus 150 free spins when creating an account. The bonus cash is credited over seven matched deposits, and each needs to be wagered 30x the deposit and bonus. You will have to clear the wagering requirements attached before claiming the aforementioned bonus, or you can forgo it and simply claim the free spins promo. If you like the sound of margaritas and burritos while visiting a Las Vegas style online casino, head on over to Mucho Vegas and claim your free spins.